Saratoga Village is one of the oldest platted communities in California, or on the West Coast for that matter. 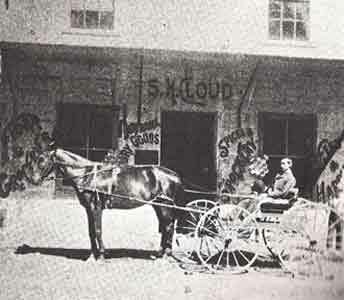 While many other little communities "just grew" in response to a gold strike, a crossroads or a ferry crossing, Saratoga was first surveyed, platted and registered with Santa Clara County in 1852 by Martin and Hannah McCarty. It is a unique village settlement in the history of California because it was not only planned and developed as a community, it has survived as an economic entity for over 150 years. Martin McCarty was born in County Clare, Ireland in 1825 and emigrated about 1846. He was in NewOrleans when the Mexican American War broke out and served in the military,remaining in the army until 1849. He came to California and worked in the mines where he reportedly made $20,000 in seven weeks. When Martin McCarty was 27 years old, he married Hannah Barry. They were wed in San Jose about 1852. Hannah Barry was 17 years old, a native of County Wexford, Ireland who had immigrated to the United States and to San Jose a few months earlier. Together they filed for a 320 acre homestead claim in the West Valley and laid out the lots for a little town. The McCarty's named their little town McCartysville and proceeded to sell town lots for interested home builders. They also built a number of buildings themselves which they rented. Unfortunately, the McCarty's soon found themselves in something of a dilemma. They thought their home sites were outside the boundaries of the Quito Rancho. To their dismay, they found when an accurate survey of the Quito Rancho was made, some of their property was included. 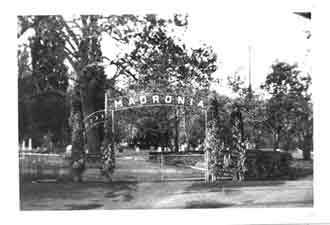 Adjudicating all of the improper rancho claims through the early California legal systems took several years and the McCarty's were finally able to file a second plat of their little town, which they did in 1862. They were forced to buy the land they had already developed from the legal owners of the land grant. The McCarty's acquired 128 acres, less than half of their first claim. Martin McCarty was killed in an accident in 1864, leaving his widow with four young children. She continued developing her property even when the name of her town was changed in 1865 from McCartysville to Saratoga. 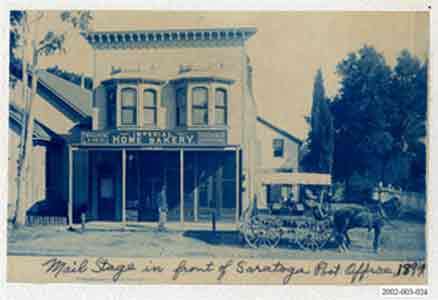 Properties in the little town of Saratoga faced the two streets, Lumber Street and Oak Street. Lumber Street was the business street with stores, hotels, the blacksmith, livery stables and a few residences here and there. 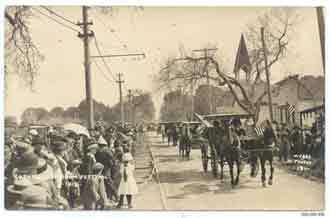 Oak Street was much quieter and was the road leading up to the cemetery. The Village School was located on Oak Street along with the Congregational Church, the parsonage and several other homes. It was a quieter and safer street, away from the large lumber wagons that came down the hill from the mills. Hannah McCarty had generously donated some of her Oak Street land as a permanent site for the Saratoga school. She established a large vineyard surrounding the school site and built a house on Lomita, over looking her acreage. When she died suddenly in 1893, she had made plans to begin residential development of the vineyard property. Hannah McCarty was only 58 years old when she died, and she did not leave a will. The probate records of her estate reveal the extent of her real estate holdings which included many of the business buildings in Saratoga Village. Over the years she had built a number of stores and residences, and she managed the properties with the help of her son. 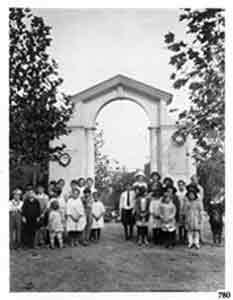 So for nearly fifty years, Saratoga Village was a reflection of the development interests of the McCarty family. Their town was built into the side of a ravine overlooking picturesque Saratoga Creek. 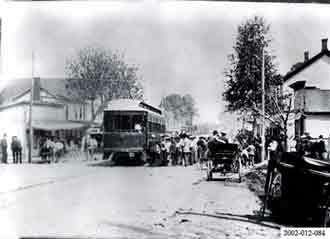 It was just two streets wide and three blocks long, ending at Sixth Street. The village included all of the shops and businesses that were important at the time; the post office, a bank, hotels, several stores, real estate offices, churches and a school.